The 2nd Africa-India Forum Summit, being held in Addis Ababa in collaboration with the 53-member African Union (AU), offers India an opportunity to develop its partnership with a region with which it has been historically connected through an old civilizational link and a shared legacy of anti-colonial struggle. While these broad contours of engagement have been laid out, efforts to give effect to the common aspirations of the two partners have been less effective. This was especially evident in the realm of economic cooperation where, until the 1st Africa-India Forum Summit was held in Delhi in 2008, a serious platform for Africa-India engagement was not available. 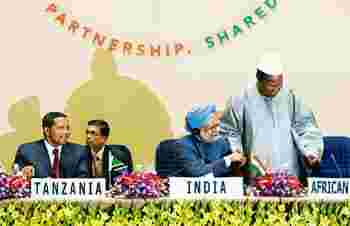 This focus on strengthening economic cooperation between Africa and India comes at a good time for both parties. Over the past few years, several African economies have shed their label as poor performers, and have experienced sustained growth in the post-crisis phase. Sub-Saharan Africa, in particular, has rebounded quickly from the slowdown, and its strong macroeconomic fundamentals will, according to the International Monetary Fund (IMF), leave it nicely positioned to take advantage of the recovery now under way. Real activity in the region is projected to expand by 5.5% this year and 6% next year. IMF predicts that the expected strengthening of oil prices in 2011 will help sustain the region’s oil exporters. One feature of India-AU trade is that the former has increasingly provided its market to the latter. The bilateral trade balance has mostly favoured the AU members, and this has increased considerably in recent years as India’s oil imports from Nigeria and Angola have burgeoned. In 2009-10, both these countries were in the list of top 10 sources of petroleum crude for India, with Nigeria being the fourth largest supplier. Strengthening of the trade links has also been accompanied by growing interest of Indian industry to look for investment opportunities in Africa. In 2008-09, India’s investment in the region was close to $2.5 billion, more than 11% of the total outward investment. While the oil sector has attracted a sizeable amount of Indian funds, investors from India have also shown considerable interest in infrastructure projects in several African countries. It is in this role as a partner in the development endeavours of AU member states that India has made the most significant contribution— enhancing the capacities of institutions and individuals in an effort to deepen the process of development. This dimension of the India-Africa partnership is set within the “Aid for Africa" scheme, wherein India offers technical cooperation to many African countries through the Indian Technical and Economic Cooperation plan and the Special Commonwealth Assistance for Africa Programme. Delivery of these capacity-building programmes will be greatly enhanced with the establishment of the Pan-African e-Network Project, which proposes to set up an e-network connecting Indian institutions with 53 countries of Africa through satellite and fibre optic links, and providing tele-education and tele-medicine services. In the three years since the 1st Africa-India Forum Summit, new vistas of cooperation have emerged; one of the more promising of these is the field of technology. A number of initiatives have been taken by government agencies, particularly the department of science and technology and the National Research and Development Corporation, to transfer production technologies that suit the resource endowments of the recipient countries. The distinctive feature of these technology transfer deals is that they have been geared towards the development of small and medium enterprises, most of which are in the area of food processing. India has long espoused the philosophy that it is “development partnership" and not “development assistance" that should be the cornerstone of economic cooperation between the countries of the South. By making this distinction, India has distanced itself from the principles on which countries belonging to the development assistance committee of the Organization for Economic Cooperation and Development, the traditional donors of foreign aid, have established their relations with the recipient countries. Partnership with AU has already provided ample evidence to support India’s position on development partnership—the 2nd Africa-India Forum Summit has set the stage for taking this partnership to new highs.